It’s that age-old dilemma faced by women everywhere: Is it ever ok to spend the night after the first date? I remember by grandma telling me that “a man will never buy the cow if he can get the milk for free”. Try working that out when you’re 12 years old and the main thing on your mind is how to get out of doing your math homework, and not doing the horizontal tango of any form. Thanks, nanna. But we don’t judge here at Cosmo. In the June issue (on sale now – run, don’t walk) we pitted a guy and a girl against each other to see if attitudes have changed on the ‘slumber party’ scenario. What do you think? 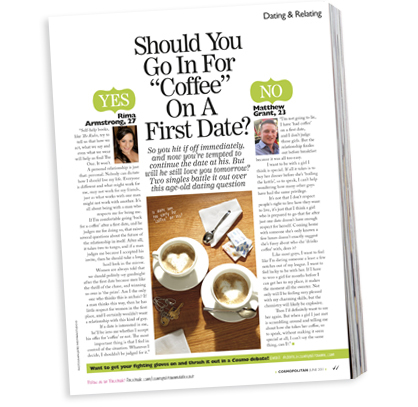 Ever ‘gone in for coffee’ on the first date? Glad you did? Regretted it? We’d love to hear your thoughts.